This House Shield is the Triquetra or Trinity Knot of the Celtic cultures. This is an interesting symbol because to me it shows a cross-over connection between the Celtic cultures and the Scandinavian cultures in that the Triquetra is very similar to the Valknut, symbol of Ohdinn. The Trinity Knots is strongly aligned with the pattern of three in the universe as well as the three “realms” of earth, sea and sky, the life givers. In the ancient Celtic beliefs it is said to have also symbolized the three aspects of spirituality through the goddesses. For example, in Celtic Ireland there is the Morrigan’s three aspects of maid, mother and crone and in Norse there are the three Norns of past, present and future. The circle the Triquetra weaves through symbolizes the never ending flow of eternal life and the binding of the three aspects of this energetic flow. To some this then acts as a level of protection, mainly from anything attempting to sever the conscious and subconscious knowing of this eternity of existence and our integral part in it all. Accompanying and enhancing the Triquetra on this Shield are two runes; Algiz/Elhaz and Eoh. 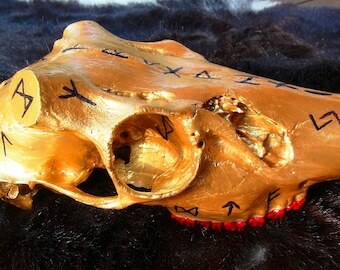 Algiz is the elk’s antlers and a heavy protection rune. The Eoh rune aligns with the continuous nature and flow of the Triquetra wherein life is found flourishing within all three levels of existence and the trunk (like in the tree of life) connects them all. 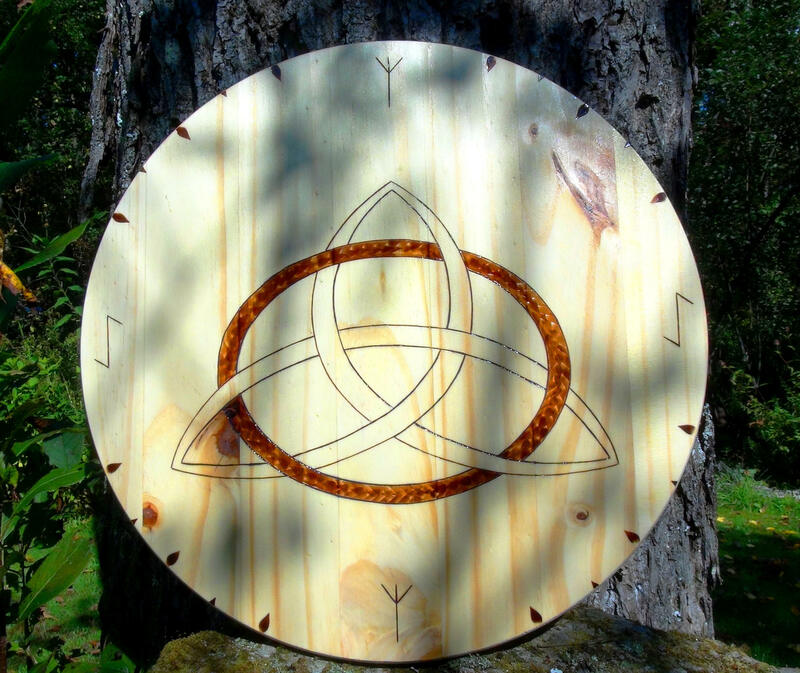 This is not only a beautiful House/Rune Shield to adorn your abode, but a very powerful symbol to enhance the eternal flow of energy and the awareness between conscious and subconscious of its reality. Holding to the traditions of my Norse, Dane and Helvetian genetics I enjoy creating House Shields or Rune Shields. These are 1x17.75” laminated pine shields. Each slat of pine is cut and sanded, then glued to adjacent pieces, allowed to dry and then sanded again to create a round shield. Once I layout the design I woodburn the shield. After the front and back are finished I apply numerous coats of water based polyurethane to protect the wood from exposure to elements. I use the water based poly because I don’t enjoy the toxic fumes of regular poly. House or Rune Shields are created using ancient symbols from the peoples of Scandinavian, old Teutonic and Helvetian lineage. Sometimes along with the symbols runes from the 24 Elder Futhark are also placed on the shields as well as filler designs to tie the elements together. Traditionally they are placed on a door or wall of a house or other building where gatherings take place, like a talisman, for protection or amplification of other energies from the natural elements found in this life; prosperity, health, friendship, fertility, happiness and so on. Please note that though the shields are coated if they are exposed directly for long periods to time to rain and snow they will gray out. Mine are displayed on the front of my house under my porch roof away from direct water contact and they hold up great!